WHICH RACERS WOULD MAKE GOOD NYC CABBIES? Bumper to bumper action, swerving, weaving, door to door battles for a spot only big enough for one machine, close competition that is sometimes results in bent sheetmetal and hot tempers, a war on wheels. So who does that describe on the Whelen Tour? We could tell when Hirschman’s face lit up and a name popped into his head, so we asked him if he had someone in mind, but wouldn’t say it out loud. But he still wouldn’t tell us. Other drivers were a little more open, but might regret that fact when the racing season starts up again. Speed51.com made the champions pick someone from their own series, but Pettit also had someone else in mind from another of the Elite regional series. 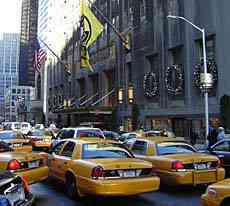 Taxis are everywhere in New York City! Those terms could describe many short track races in the NASCAR Touring ranks, but they also could easily describe something more familiar to millions of city dwellers – the way of life that taxi drivers in New York City face every day and night just doing their jobs. With so many parallels between the two worlds, Speed51.com decided to ask the NASCAR Touring champions who were in New York City last week for NASCAR Champions Week who from their series would be good behind the wheel of a New York cab. But first, what are the qualities that the two types of drivers share? Fultz overheard that comment and agreed completely. “Yeah, I’ll blast my way right through,” said Fultz. Fultz also thought of a fellow competitor who would fit the mold in SES competition..
Another Southerner might do pretty well also. Midwest Series champion Justin Diercks mentioned Eddie Hoffman as a guy who would likely be great behind the wheel of a cab. NASCAR Dodge Weekly Racing Series champion Peyton Sellers took the high road and wouldn’t drop any names. “I don’t know right off,” said Sellers at first. After thinking for a moment, he clammed up. “I’d hate to get anyone in trouble,” said the well-mannered 21-year-old. And some drivers were picked more because of their attitude and physical attributes than their driving style. 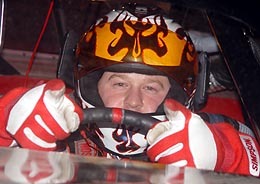 Jeff Fultz picked Jason Hogan as a good driver to wheel a cab. But if you climbed into a taxi and saw this character behind the wheel, wouldn't you take your chances walking instead? If Matt Kobyluck drove a cab, he probably wouldn't get robbed very much. Since Kobyluck stands 6’5” at 230 pounds, works out and shaves his head, we would tend to agree with Santerre. He’s not someone who you would want to try to stiff a fare. Burt and Jason Myers didn’t win the Southern Modified championship this season, but the two racers were in New York to represent their family at the annual Myers Brothers Breakfast. They liked the idea of trying to drive taxis themselves. Jason wasn’t sure that he was qualified to judge who he races against would also be good at taxi-driving. But when we pointed out that Junior Miller picked Frank Fleming, they thought that he would be a good choice. “That would be about right,” said Jason. 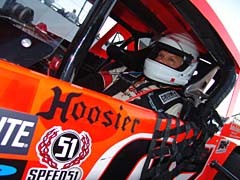 Truck Series champion and former short track kingpin Ted Musgrave thinks that maybe we had it in reverse. 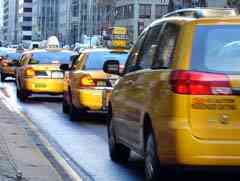 Instead of having racecar drivers wheel taxis, maybe the taxi drivers should try racing. “Well, I’ll tell you what, I don’t think that anyone that I know could even make it in the Big Apple,” said Musgrave of the drivers who he remembers from his short track days. “From what I could see from the ASA and the ARTGO days, I don’t know how to relate to that now. It’s been so long and there were so many good drivers there. "We were so cautious to try and bring the car home without scratching it up. The way that they drive here, that wouldn’t happen. Or they could just loan a few cans to the touring champions. There were a few who thought that would be a very good idea. There are a few Southern Mod guys who think that Frank Fleming could get them through New York traffic fast.